You have heard that it is a good thing to provide an effective humidifier for baby whether a newborn infant, a little older baby, toddler, and young children. Why should you use a Humidifier for your baby? Thermoregulation—methods for sustaining heat and fluid equilibrium vital to newborns and infants exposed to a dry and cold atmosphere. Humidity—moisture in the air will prevent the loss of heat and water for the baby’s skin and nasal passages. Humidity for a baby ideally should be at 50% with a room temperature of about 70 degrees F. (21 C.). Your baby will benefit with humidly and temperature levels at these numbers. The baby’s room will not feel too warm or too dry. Babies sleep better with a cooler environment and moisture without feeling chilly. In a dry winter atmosphere, a humidifier for your infant, toddler, and older children will loosen the dry and congested membranes so that the secretions can be expelled and moved from the baby’s little body. Stuffy babies are miserable; we know how we feel when we are stuffed up with congestion in our nasal passages and lungs. Adults can use cold medicines, cough syrups, and get flu shots. Babies and youngsters cannot do this. The Food and Drug Administration (FDA) tells us not to give children over-the-counter medicines when they are under 2-years-old. Flu shots should never be given to babies under 6-months old. Always check with your healthcare provider about medicines for youngsters and infants. What is a Humidifier for the Baby You Ask? 8. How Quiet is the Warm-Mist Humidifier? Humidifiers put moisture into the air. During the wintertime with the heat turned on, or in dry hot climates, the humidity can be as low as 10%. In semi-arid climates, the humidity can be as low as 2%. Dry air is irritating to a baby’s sensitive skin, nasal passages, and lungs. Babies are too immature to take over-the-counter medications when they catch a cold, or have an upper respiratory infection. The best pediatricians recommend humidifiers for babies when they live in a dry environment. Adding humidity to the air helps babies and everyone lessen cold and flu symptoms. Congestion is without a doubt relieved with humidity. The mist from a humidifier is known to unstuff congested mucous membranes in the nose, throat, and lungs. Babies can breathe more comfortably and they recuperate sooner. Dry itchy skin, cracked dry lips irritate a baby so they cry. You want to find a way to make them more restful, comfy, and relaxed. There is nothing worse than a crying baby suffering from discomfort or any measure of pain. Parents hurt when their children hurt. Another benefit from a humidifier is the gentle hum of the device lulls your baby or toddler to sleep. Sleep is necessary for the little bodies to heal—and when baby sleeps, you can get some rest. A comfortable baby is a happy baby. With the right amount of moisture in the air, think about the best room humidifier for your baby. 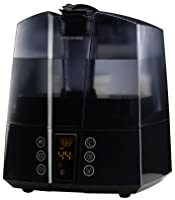 We have provided you here with some of the top selling humidifiers in the marketplace today. There are two types of humidifiers for smaller room areas for help in relieving congestion and a dry cough. Please read more detailed information here. There are some features a mom and dad want to have for functioning benefits in the humidifier they choose for their baby. 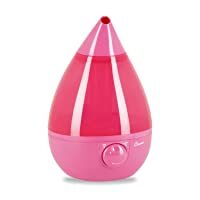 Low noise—for your baby to relax and have restful healing sleep when ill, you want a quiet humidifier. Automatic shutoff—for when the water is gone so that you will not be concerned with the unit burning out when your baby is sleeping. Hygrometer/Humidistat—that is adjustable for maintaining your desired humidity level in the baby’s nursery or room. Antibacterial qualities—for keeping bacterial growth in water at bay such as ultraviolet (UV) lights, cartridges, or filters. Cleaning—preferably a unit with a removable water tank for ease in cleaning and refilling. Handles—to make carrying easier with a wide opening for cleaning and refilling with water. We have listed here our 10 best choices for your baby’s room or nursery considering the best performance and functionality including customer ratings. Which Type of Humidifier is Recommended for Your Baby? 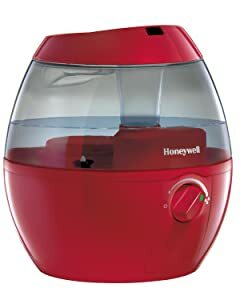 The Honeywell HCM-350 is great looking providing you with a 99.9% germ-free mist using its UV (ultraviolet) technology, killing 99.9% of mold, fungus, viruses, and bacteria that is in the water. It is available in black or white to fit with your décor. The large tank holds 1.093 gallons of water and mists 2-gallons in 24 hours meaning you will fill the tank two times to humidify a medium-sized room of 300-square feet depending on who you ask. It is easy to move from place to place and easy to clean. With these advantages, gone are the days of humidifiers dripping water all over and carrying those types were next to impossible. With the Honeywell, convenience is right at your fingertips. It is quiet so will not disrupt baby’s sleep. It is break resistant and made of one piece of plastic having no seams that can leak. Having dishwasher safe parts and water tank, you do not have to clean it tediously by hand at the sink. We all know that we cannot put our hands in the hottest water dishwasher’s use making this an advantage. In addition, the dishwasher’s extra hot water kills germs as well. There is no white mist or condensation on furniture and that is great for the baby’s room with this Honeywell cool-mist humidifier. 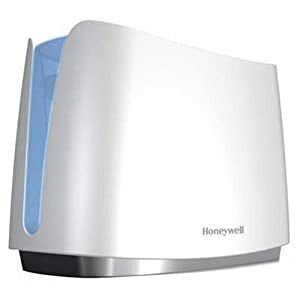 Honeywell’s ProTec filters efficiently clean the water entering the humidifier and the filter is treated against microbes as well as keeping the water clean from harmful mineral accumulation from tap water. It utilizes an antimicrobial treated filter HAC-604AW (included) and an automatic moisture balance system. It does operate 25% quieter and runs 24 hours on one filling of water provided by Honeywell’s QuietCare Technology. The system is self-regulating adjusting the amount of moisture the air can hold (relative humidity). You are able to see the water level through the transparent front area. A green light indicates the unit is on and a red light glows when the UV light needs to be replaced. It does not automatically shut off. This is an evaporative humidifier, not ultrasonic, so no white dust residue will be on your furniture and floors. It uses a USA standard 110/120-Volt outlet, is UL approved, and operates at 60-Watts. 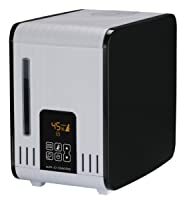 It does not have a built-in humidistat, but they can be purchased for about $15 to determine the humidity in your room. The dimensions are 8.5” wide x 11.25” tall x 16” long and it weighs 1.5 pounds. You will receive a User’s Manual and a 3-year Limited Warranty. The Honeywell Mistmate is a small-sized room unit and comes in black, blue, red, or white to harmonize with your baby or child’s room or nursery décor. The unit will run approximately 20 hours on one tank filling of a half-gallon of water. No filter is required and the user-friendly control knob allows you to change output settings the way you like it. The Honeywell humidifier will automatically shut off when the water is gone. This gives you added security when having it in your child’s room at night. It is whisper-quiet and will not keep the baby or you awake. This will be the perfect fit for a bedroom nightstand, dresser top, or any small area. The large reservoir is easy to clean and fill with water. The device plugs into a USA standard 110/120-Volt outlet, and it is UL listed. The cool visible mist is refreshing for congested sinus and nasal passages and relieves dry coughs, a dry mouth, chapped lips, nosebleeds, and dry skin. It provides relief to those suffering from allergies, asthma, and is good for adults with COPD and emphysema. With humidity, viruses do not grow well, lingering in the air and on surfaces. For this and all humidifiers, allow it to acclimate to your indoor temperature for it to start functioning correctly. Do not add Vicks® or other mentholated products to this unit. It is recommended not to add essential oils. Clean the unit weekly by adding distilled clear vinegar through it and rinse well. Nothing to disassemble, and it’s now ready to go again. If you are storing the unit, allow it to air dry. It is best to used filtered or distilled water to avoid white flakes and dust that are mineral deposits found in tap water and well water. The dimensions are 8.5 x 8.5 x 9.5-inches tall and weighs about 3 pounds. It comes with a User’s Manual and a 2-year Limited Warranty. This is the cream of the crop for an ailing baby or child. The warm-mist humidifier by Vicks® is created to disperse medicinal vapors so wonderful for a cold or flu and let’s hope your baby never gets the flu. The medicine is wonderful for clearing out the sinus cavities and congested lungs, and nasal passages. The vapors will loosen up congestion in the lungs so that it can be expelled by coughing it up. This unit is not an ultrasonic humidifier. The unit is white with a light blue water reservoir holding 1-gallon of water to operate for up to 12-hours. You will feel secure knowing it will run while you and your baby are sleeping with its automatic shut off. It is quiet and has a dim nightlight that cannot be turned off. When the water is gone, the light turns red, and when the unit is on, the light is green. No filters are required. The medicine cup will hold medicated Vicks® Vapostream or Kaz for beneficial soothing breathing for your baby, or anyone who is congested. The unit heats the water to make a steam vapor that is 96% bacteria free. By mixing with dry air in the cooling compartment, the unit will disperse warm moist air into your room with 2 comfortable settings—low and high. The humidifier can be operated with only water without medication, as you need. Do not use Vicks® VapoRub in this unit—it is rubbed onto the chest. Be sure to place the unit at least 12-inches from the wall because the steam will build up on walls, windows, and furniture. The water boils at 212 degrees F. (100 C.) producing hot steam. Do not add salt to the water—it raises the boiling temperature and will take the water longer to boil. To avoid mineral build up, use filtered or distilled water. Tap water contains minerals that make it hard to clean and the minerals stick to the heating element. Clean with distilled clear vinegar and water. The durable plastic is BPA-free (Bisphenol A) so there are no toxins for your baby or others. Plug into a standard USA 110/120-Volt outlet, and it is UL listed. The base is 6.5” x 10” x 12” tall and weighs about 4 pounds. The unit comes with a User’s Manual and a 3-year Warranty. Be sure to read the instructions carefully for this specific type of humidifier that uses medication. The TaoTronics® Ultrasonic Cool-Mist Humidifier is cutting-edge in features and technology. When you want a humidifier for your baby or child’s room there are certain things you want to know with outstanding progressive features. This unit has them! The unit has an LED digital display screen for timer settings, humidity level (humidistat), staying on for 1-24 hours, and 3 mist levels of low, medium and high. It provides you with a nightlight, has no noise so your baby or child can sleep restfully. The built-in water purifier is an added benefit ridding the unit of microorganisms, magnesium, and calcium deposits for a pure and healthy mist. When the water level is low, the unit automatically shuts off. The unit holds 4 liters (1.05 gallons) of water to humidify up to 538-square feet. It will operate 15 hours to run all night with the sleep mode without needing to be refilled. The nozzle turns 360-degrees. It is 120V/60Hz 230V/50Hz, power 30W and plugs into a standard USA 110/120-Volt outlet, and is UL listed. European and other countries use 230/240-Volts so this will work there. Water adds to the bottom and there are 2 handles for easy carrying. Note: TaoTronics® states not to add essential oils or perfumed chemicals into the water, including Vicks®. Only fresh clean water is advised. Oils are corrosive and will void the warranty. This is not an aroma diffuser. It is strictly a humidifier only. Do not believe the reviews you read where people add these oily items. The manufacturer warns against this practice. The ideal humidity is between 30% and 50%. If it’s higher, your windows will drip condensation and mildew will grow. TaoTronics® recommends cleaning the water tank and transducer once each month. The manual does not show where this is located, or what it is in nonprofessional terms, so I will tell you. The transducer is the same as the plate and is the large black recessed circle area on the far left when the digital screen is facing you. A transducer converts one type of energy to another. In this case, the transducer vibrates at an ultrasonic speed turning the water into a fine mist. The round circle area must be cleaned or minerals from tap water will corrode it. That’s another reason filtered or distilled water is best. To prevent leakage, know that lime scale and minerals develop from tap water, or bugs become stuck in the water and drown. Clean the reservoir as noted below to clear the blockage. Every 3 months rinse the filter with clean water. Immerse the filter with distilled clear vinegar every 6 months for 10 minutes then rinse under clean running water. To store, drain the unit of water, allow to air dry, storing in a safe location. Always unplug the cord before draining the water out and cleaning. The dimensions are 8.07” W x 5.31” D x 11.81” H and weighs 3.2 pounds. A User’s Manual and Warranty card is included. The Air-O-Swiss warm- or cool-mist humidifier has all the bells and whistles at an affordable price. It’s technology is perfect for a baby’s room, an older child’s room and adults. It is made of a durable plastic in black. The unit has a digital key pad on the front, and it covers 600-square feet. It uses high-frequency vibrations for producing a very fine mist that evaporates without touching surfaces. When you select the preheating mode, the mist will be at an enjoyable 104-degrees F. (40 C.). The water tank holds 1.5-gallons and humidifies 3-gallons of water in 24 hours. It uses ITC Technology (Intelligent Temperature Compensation) that means the temperature you select will be monitored, and the output mist will change according to the ambient air in your room. The relative humidity adjusts to the temperature in your room. It uses a hygrometer/humidistat to regulate the humidity. The mist disperses from 2 ports on each side. Place the unit 3-feet off the floor for the mist to circulate into the air. The timer can be preset for 1 to 8 hours or in a continuous mode. The sleep mode is a pre-determined night humidity level to keep your room at the right amount of humidity. The unit operates on a USA standard 110/120-Volt outlet, and is UL listed. This ultrasonic atomizer system does not like oils so do not use aromatherapy essential oils or mentholated oils—these gum up the works. Distilled water has no minerals, therefore, your machine will not have mineral build up. Rinse the Hydro Cell in water thoroughly before using the unit. After you insert it, the unit works immediately. The EZCal packet for cleaning the unit is included. You can also use distilled clear vinegar, a cotton swab to clean, then rinse and let air dry. Do this as well for storing in a safe place. The humidifier light comes on when the unit needs to be cleaned. The dimensions are 14 x 11.6 x 11.6-inches and it weighs 9 pounds. A User’s Manual and a 1-year Limited Warranty are provided. The award-winning Crane Teardrop Shape Ultrasonic Cool-Mist Humidifier holds 1-gallon of water putting out 2.3-gallons of moisture each day. It is a cool design that will look adorable in the baby’s room or any room. The striking 8 LED light colors of blue, charcoal, green, gray, orange, pink, white, and white with blue are what you can choose from. The cool-mist humidifier will add moisture to relieve your baby from coughing, uncomfortable dry nasal membranes, dry mouth, the common cold, and flu symptoms. The unit increases air moisture for easier breathing and restful sleep for your little one. 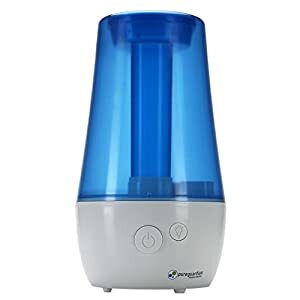 Nasal congestion, sinus irritation, dry skin, and nosebleeds will be alleviated for anyone using this superb cool-mist humidifier. The Crane is energy efficient and humidifiers are highly suggested by Pediatricians. The misting nozzle turns 360-degrees with a variety of settings on the unit. The ultrasonic unit is whisper-quiet and will run up to 24-hours on one tankful of water. Additionally, it has an automatic shut off feature so you will not have concerns about the safety of your baby at night. This unit does not need a filter to operate; however, a demineralization filter is available on Amazon using Model No. HS-3161. Minerals occur from hard water from the tap. Filtered or distilled water will keep your unit running better requiring less clean-up time. To fill the water reservoir, remove the teardrop water tank, unscrew the cap on the tank, and fill to the line on the water tank. Replace the cap securely being sure the rubber seal is in place then put the water tank back on. It is recommended you do not put it on the floor or carpet but on an elevated surface not made of wood. The cord is 6-feet long, plugs into a USA standard 110/120-Volt outlet, and is UL listed. The unit only uses water—do not put essential oils or Vicks® into it. It will become gummed up and not function. It is important that you clean the unit regularly. Crane recommends emptying the water in the tank each day, making sure you pour it out away from the air outlet hole. Disinfect the water reservoir and tank weekly by using distilled clear vinegar and a fresh water solution. Let it sit for 30 minutes, then rinse. If you should have mold, clean with a little bleach in water and a cotton swab or cloth to remove it. The Crane Descaler solution HS-1933 is available on Amazon if you have hard water build up. It is important to disinfect and dry completely before storing away after you’re finished with it. The dimensions are 9.4 x 13.5 x 9.4-inches and weighs 4.5 pounds. You will receive a User’s Manual and Warranty. This humidifier will provide up to 70-hours operation time for a baby’s room or any other room holding 1-gallon of water. It will put moisture in medium-sized rooms of about 200-square feet. When your children or family are feeling congested, have a cold or allergies, this unit will be a wonderful welcome. It also helps with dry skin, congested sinus, and nasal passages. You will relieve chest congestion greatly with this humidifier. The unit has Silver Clean Protection that fights mold and mildew growth on the surface of the water in the tank. This protection is embedded in the tank so that you will not have slimy water. With the Ultrasonic Technology used, the unit gently wafts a fine mist putting humidity in the dry air for comfort. The low and high cool-mist settings let you have it your way for your needs. The design makes it easy to use and a nightlight is available if you want to use that for the kids’ room. The unit is whisper-quiet for a peaceful night’s sleep. The running time of the unit depends on if you use it at low speed or high speed. Obviously, if you run it on high, the water won’t last as long. Wash it once every couple of days with the included brush and your own cotton swabs very carefully including around the actual ultrasonic disc about once a week with about a cup of water mixed with 2-3 tablespoons distilled clear vinegar. The dimensions are 7.5 x 7.5 x 13.2-inches tall and it weighs 2.3 pounds. The Limited Warranty must be done online using your sales receipt. The warranty period is not stated, but it is probably addressed online when you register your humidifier. 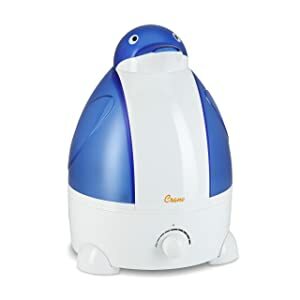 The delightful toy shapes of the Crane Adorable Ultrasonic Humidifier makes it a fantastic unit for a baby or child’s room and there are 10 animals to choose from. This is a best option to over-the-counter cough syrups and cold medicines for a young child’s body. Is your child old enough to reach and grab the animal because it’s so cute? The BPA-free (no toxins) design of the unit makes it easy to use, it is quiet and humidifies a small space with its removable 1-gallon tank covering about 150-square feet that’s just right for a baby or child’s room. It will put out up to 2.1 gallons of moisture up to 24 hours. It should sit at least 2-feet off the floor. It comes with a 5-foot cord that plugs into a standard USA 110/120-Volt outlet, and is UL listed. There are no lights except for green indicating the unit is on and red to let you know it’s out of water. It will be easier to breathe the moist air and will relieve dry cough, dry nasal membranes, flu symptoms, dry skin, nosebleeds, chapped lips, and sinus irritation. Humidity will soothe a child’s ability to breathe easier and sleep soundly at night. The cool mist unit does not need a filter. The built-in sensor tells the unit to shut off automatically when the water is gone. The energy-efficient humidifier uses no medications and is perfect as a gift for baby showers and holidays at its affordable price. The Crane has earned many awards including Mom’s Best Award Winner. Most tap water and well water have many minerals and calcium that adhere to everything. Calcium can create a white dust on furniture. It is best to use filtered or distilled water to reduce cleaning and mineral build up. Crane provides a demineralization filter HS-1932 available at Amazon. It is recommended that you put the humidifier on an elevated surface. Do not put it on a towel, carpet, wood, or metal. It is important that you clean the unit regularly. Crane recommends emptying the water in the tank each day, making sure you pour it out away from the air outlet hole. Remove the water tank from the unit, unscrew the tank cap, and fill the reservoir with water. Replace the tank cap, making sure the rubber cap seal is in place, and place the water tank back onto the unit. Disinfect the water reservoir and tank weekly by using distilled clear vinegar and fresh water solution. Let it sit for 30 minutes, then rinse. If you should have mold, clean with a little bleach in water and a cotton swab or cloth to remove. It is important to disinfect and dry completely before storing away after you’re finished with it. The dimensions are 10.6 x 10.6 x 13.8 inches and it weighs about 5 pounds. It comes with a User’s Manual and a 1-year Limited Warranty with dated proof of purchase in the U.S. 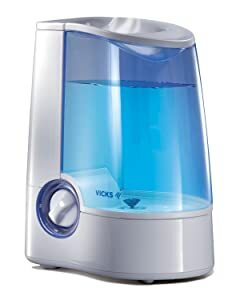 This Vicks® humidifier is a mini unit with a small footprint so perfect for a baby or child’s nursery or room selecting from either pink or blue. It works well for others as well. Great looking, and easy to clean makes this an affordable option for dry environments. You will never have to replace filters because the unit does not use them. The reservoir holds a half-gallon of water and will operate for 10 hours. The humidity control permits you to set it the way you want it. Plug it into a USA 110/120-Volt standard outlet, and it is UL listed. The integrated Scent Pad Heater lets you use the soothing Vicks® VapoPads VSP-19, or the soothing mist of lavender and rosemary VBR-5 with the unit, ideal for a fussy baby. We know that menthol and lavender are calming and relaxing and will help everyone have a good night’s sleep. Just place the pads in the scent pad drawer and vapors will soon happen. Do not use essential oils—use only these pads. When the tank is out of water it automatically shuts off giving you confidence that it will not leak or burn out in the baby’s room. The see-through durable plastic lets you see the water level at all times. Do not use essential oils with this humidifier. The manufacturer recommends cleaning the unit at least once each week as instructed in the manual. Minerals will be deposited from hard or well water causing the unit to not function and will void the warranty. Remove the top half from the white base, twist the plug to unlock the cord from the unit, and pull the water unit out to fill. Put the cord back in and twist to lock it into place. The dimensions are 8.3 x 9.1 x 8.3-inches and weighs 3 pounds. It comes with a User’s Manual and 3-year Limited Warranty. 1. Click "Read Reviews" button Below. 2. Click "Buy from Amazon" button below product image to check Discounts. 3. Place an Order with Amazon secure system. 2. Click "Buy from Amazon" button under product image to check Discounts. 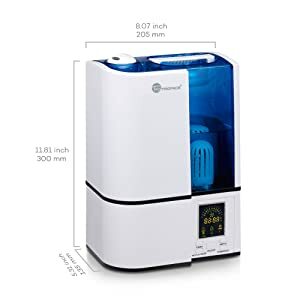 There are advantages and disadvantages to either humidifier and you will need to decide which is best for your situation and needs. There are no significant differences in how a cool- or warm-mist humidifier functions; they both work in the same way extremely well to humidify the air. There is no appreciable difference in temperature once a warm-mist humidifier’s mist touches your baby’s skin or gets to the lungs. The temperature will be the same temperature as the room anyway. Ultrasonic humidifiers are the most quiet so that your baby can rest. Warm-mist humidifiers heat the water with a built-in heating element. The cost to operate is about the same as a 60-Watt light bulb each month—just pennies. You can use a humidifier all year, not just the winter or colder months in some areas. You can maintain a humidity level of about 50% at all times of the year so that your baby or toddler does not have congestion, a dry mouth, a nose so stuffy that nose breathing cannot be accomplished. A humidifier will help keep the baby’s mucous membranes moist in the nasal passages so there will be no bleeding from baby’s nose. Your bundle of joy will be happier and sleep better at night. Regardless of which type you buy, when you use hard water from the faucet you will have a white dust on the floor and furniture from the minerals in the water. You will have more mineral build up in the unit that requires more rigorous cleaning. Distilled water might cost you a dollar a gallon, but it’s worth it in terms of clogging and cleaning buildup that must be removed repeatedly. Distilled water will increase the efficiency of your humidifier. A cool-mist humidifier must be cleaned regularly before each refilling of water. If you do not keep it clean and disinfected with a little bleach, it will grow bacteria that can be breathed into your lungs. This unit must be carefully and meticulously kept clean. A warm-mist humidifier boils the water into steam. This sterilizes the water before it is dispersed into the air. All humidifiers will clog up with minerals from tap water if it is hard, and it usually is. The best advice is to use distilled water at about $1 per gallon at the supermarket. Humidifiers are important for newborns, older babies, toddlers—everyone who is congested due to dry conditions. Dry climates at 2% to 20% outdoor humidity means the inside is the same. When heat sources are turned on during the winter, the indoor air is even more dry. Humid climates that have up to 100% humidity outdoors will not maintain that level of humidity indoors when the heat is turned on. Air conditioners remove humidity making the interior dry, and humidifiers can be operated with air conditioning running as well. 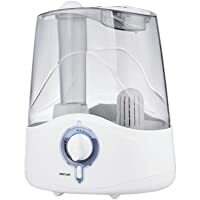 For those miserable from nasal and sinus congestion, dry cracked lips, allergies, congested lungs from upper respiratory infections—a humidifier is a must to put moisture into the mucous membranes to loosen and expel the mucous. Humidifiers eliminate the need for over-the-counter medications that simply dry up mucous for it to come back later. What needs to happen is to loosen the mucous so the body can be rid of it. Drink lots of water to help the body make mucous to expel. Warm-mist—also known as a “vaporizer” are filled with water in a tank and the water is boiled using the unit’s heating element resulting in a warm mist into the room. Most humidifiers in the marketplace today automatically shut off when the water is gone. Most parents and doctors shy away from warm-mist humidifiers due to hot water accidents. Cool-mist—also known as an “impeller” humidifier uses a small internal fan to disperse a room-temperature mist into the room. They use ultrasonic or evaporative technology. The cool-mist evaporative units use its internal wick filter to absorb water whereas the small fan forces the air through the filter. The water evaporates in your room as a very fine invisible mist. On the other hand, ultrasonic vibration technology used in the ultrasonic humidifiers make a very fine cool mist that is whisper-quiet in your room. Warm-mist—boils the water therefore they are safer in terms of the air you breath. Since they use no fan, they are quieter. Ultrasonic units are available using warm mist. These are not as compatible for large areas; they work best in smaller rooms. These units tend to build up more mineral deposits during the boiling procedure. They are more pricey and tend to be more comfortable when the days and nights are cold. Cool-mist—does not use heated water and use less electricity. These are safer for kids’ rooms, bedrooms, and any area where little ones and pets might burn themselves. Evaporative units are noisier due to the fan operating. Cool mist can make the ambient air feel cooler. These work best in larger rooms. The cool-mist humidifiers are safer for toddlers and youngsters to be around since they have no heating element. The warm-mist boils water and could pose a hazard around the toddlers and young children, including pets. Be aware of where you put the humidifier. Put it on a flat surface but not on the floor or a high chest where kids and pets can get hold of it. Remember to unplug the humidifier when not in use, and for cleaning. Do not close the nursery room door when it is running because the room will be too humid. You need air circulation not a sauna for your baby. The cost for cool-mist humidifiers is less than the warm-mist units because they have no heating element to pay for and energy costs are lower. Warm-mist do not need replacement filters as cool-mist humidifiers do. The cool-mist humidifiers must have the wick filters replaced every 2 months. Overall, the long-term costs for a warm-mister is lower. Cool-mist humidifiers are somewhat more noisy due to its fan. Some models now have a silencing feature for sleeping. Both the cool- and warm-mist humidifiers require cleaning maintenance. The warm-mist takes more time to do cleaning than the cool-mist unit. The warm mister creates more mineral deposits in the unit. Therefore, a cool mister is easier to maintain. A warm-mist humidifier is best for babies and because babies are not mobile, they won’t be reaching for it. The water is boiled eliminating bacteria to be breathed into the baby’s lungs. It will help the infant breathe easier by reducing congestion. The soothing mist moisture will lull the baby to sleep for healing. A main concern is the amount of noise the warm-mist humidifier puts out. Boiling of the water makes some sound. The baby can sleep with this slight noise because it is calming and restful for the infant. 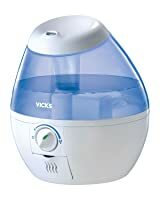 Some warm-mist humidifiers provide a medication cup for adding medicated inhalants such as the Kaz Inhalant, Vicks®, or VapoSteam (not Essential Oils). Put the inhalants only in the special cup, not in the water. Humidifiers are straightforward. They are user friendly. Read the instructions that are included with your unit. Fill the reservoir with water, plug in, and turn on. Each type of humidifier will work its own specific magic to create humidity in your life. 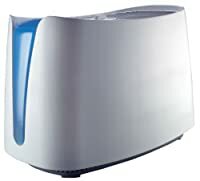 A functioning humidifier must be placed on a dry surface that cannot be reached by children. Some manufacturers will state the amount of space from the floor and walls. Please do it for safety. Unplug the humidifier before cleaning and refilling with preferred distilled water. Watch the humidity level ideally at 30-50%. Clean the tank after each use when it is empty to avoid bacteria, mold, and mineral deposits. Do not use essential oils in a humidifier unless the manufacturer’s instruction manual states you can. If you want aromatherapy, purchase a diffuser for that purpose. Never put your unit in water to clean it. Immersing it in water will ruin the electrical components forever. When using bleach: Use a ratio of 9 to 1 – (9:1). That means 9 parts of water to 1 part of bleach for cleaning and disinfecting your humidifier. Too much bleach can be hard on the plastic. An example: 9 ounces of water and 1 ounce of bleach. If you need more, double or triple it: 18 water: 2 bleach; 21 water: 3 bleach. Hopefully, that is easy to understand. All humidifiers need to acclimate to the indoor air temperature when you receive them whether it’s a hot or cold day. A hygrometer measures the percent of humidity (moisture) in the air in a room. Its only purpose is to give you a manual or digital read-out. 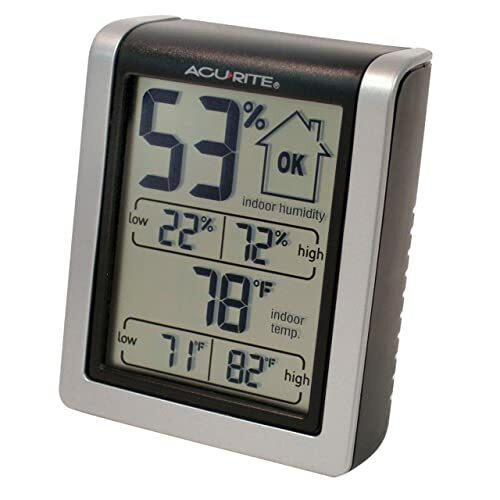 A hygrometer is sold as a small battery-operated unit that you can hold or put on a shelf to get a quick readout. A hygrometer is sometimes built into a whole-house humidifier system. If it is not attached to a humidistat, it does not control humidity—it only displays the relative humidity in the room. A humidistat is a built-in appliance feature that does control the humidity that is emitted into a room. A humidistat is not sold alone, but is a control device that is designed into an appliance or attached to a furnace. Both may be related to humidifiers or other appliances but have very different functions. A hygrometer will signal either the need for a humidifier or dehumidifier, whereas a humidistat will help the appliance control that humidity. Which humidifier is best for you? Essentially, it comes down to your personal preference. We hope the evaluations here will provide you with enough information for a reliable decision when purchasing a humidifier for you baby and others. Pediatricians recommend using humidifiers rather than over-the-counter cough and cold medicines. Humidifiers are not only more effective at relieving nasal, sinus, chest congestion, common cold and flu symptoms, dry chapped lips, and cough, but they are also safer than over the counter cold medicines—they have no side effects. The comfortable environment created by the humidifier helps your baby to sleep peacefully at night. For a best humidifier for baby, please consider the 10-humidifier brands outlined here that are our best picks for you. May your life be pleasantly humidified. Why, for the love of all things holy, do none of the manufacturers (or reviews) talk about light? The Crane, supposedly the “cream of the crop”, has a light inside that makes the ENTIRE WATER TANK GLOW ALL NIGHT LONG and there’s NO WAY TO TURN IT OFF!!! EVER!!! Here we are trying to get a nice dark environment for the baby to sleep and there’s a freaking lighthouse beacon in the room. It’s insanity. We tried cramming a sweater over top of it but that got all damp and gross, and we can’t find a solution. What am I missing?! How do people love this so much?! What am I doing wrong?! !